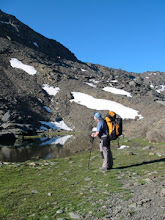 Our intrepid Friday walking group joined us for their third (and Peter's fourth) trip to Spain. 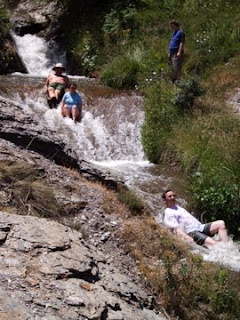 Based in the hotel Lanjaron they were joined by three others for an adventure activity holiday. During the week we managed to walk, climb, cross rope bridges, negotiate water slides, and explore the spectaculour caves at Nerja. Being a holiday, we also visited the beach, ate icecreams and enjoyed afternoon drinks at Mike & Jane's mountain house. A great week, lots of new experiences, confidence gained and pictures to remember it by. We held our first GPS navigation course last Saturday. After days of lovely hot weather, the forecast was not the best. However we were joined by 3 GPS newbies (including Mick, who has now been on all 4 of our navigation courses). Rob Tunbull from Outside provided some brilliant expertise and support, Despite the weather, everyone enjoyed making the most of their new found knowledge as we wandered around Longstone moor and then returned to see where we had been on Memory Map. A worthwhile day, and definitely to be repeated later in the year. Received an email from one of the participants on the Disability Awareness course, saying how much he had learned. Found that he had written a lengthy and very positive report on the MLTA forum. Thanks very much Peter.